The great anti-Catholic hysteria in England lasted a little over two hundred years. The Elizabethan state machinery gave it birth in the later years of the 16th century, successfully turning the popular religion of the English into a foreign thing, to be feared and despised. During these early years, those who had retained the Catholicism of their forefathers were penalised, and increasingly persecuted, until practice of the Faith was itself punishable by a grisly public death. Catholicism underwent a false spring in the years after the Restoration of 1660; at that time, a chapel was built in Ipswich, and it was even possible for the Jesuits to open a school in the ruins of Bury Abbey. The Glorious Protestant Revolution of 1689 put an end to that, however; during the 18th century, the Church was again outlawed as a treacherous superstition. The end of persecution began, ironically, with an attack on Catholicism abroad. In 1789, the people of Paris rose up against their masters. This violent and traumatic act is viewed by many historians today as the defining birth moment of the modern age. One of the targets of the French Revolution was the Catholic Church, and hundreds of French Priests sought refuge abroad, many in England. They met with a broadly sympathetic welcome, not least because the English State was living in fear of a Revolution itself. However, there was something else; it was only nine years since hundreds of innocent Catholics had been killed in the London pogrom of 1780, the so-called Gordon Riots. In reaction, there had been a thawing of the hysteria; a new warmth, born, perhaps, out of shame. The Priests were taken in by sympathetic families. One Priest, Pere Louis Simon, came to Ipswich, to the home of Mrs Margaret Wood,a Catholic woman living in Silent Street. At that time, an Ipswich Catholic wanting to attend Mass had to travel to Bury, or to one of the homes of the landed Catholic families, the Gages of Hengrave or the Rookwoods of Stanningfield. Pere Simon began celebrating Mass in Margaret Wood's house in Silent Street, and continuing to do so when she moved to Carr Street. It was the start of an unbroken celebration of Mass in the town that has lasted more than 200 years up to the present day, a healing of the break of the Reformation more than 200 years earlier. Ipswich, it must be said, was a staunchly Protestant, non-conformist town; even today, Anglican worshippers are in a minority. There was still a certain amount of anti-Catholic prejudice, and the Reform laws giving Catholics equal rights were still almost 40 years away. Eventually, the upheaval in France was over, and Pere Simon returned to settle his affairs, and sell a small amount of property inherited from his family. He returned to Ipswich with the proceeds. He would spend the money, and the rest of his life, re-establishing a Catholic presence in his adopted home. He bought five acres of land on Albion Hill, part of the heathland of what was then the eastern outskirts of town. The Woodbridge road ran beside it, and Pere Simon built a cottage, set back from this road. Its neighbours were an 18th century house to the east, and the Albion Mills to the north and west. Inside the house, he prepared a chapel, the first permanent home for the Blessed Sacrament in Ipswich since the Reformation. Eventually, when the time was right, he extended the cottage eastwards by building a church. It was dedicated to St Anthony. It was the same width as the cottage, with an entrance facing on to Woodbridge Road. The doorway was placed in such a position that it was obscured by existing trees, to enable the Faithful to come and go unobserved. St Anthony was consecrated on 1st August 1827 by Dr Walsh, the Vicar Apostolic for the Midland Region. Vicars Apostolic were, effectively, Bishops-in-waiting, as the Hierarchy had not yet been restored to England and Wales. This would not happen until 1850; in fact, use of the church for the celebration of Mass was technically illegal, since Catholics did not receive the right of free assembly for worship until 1829. They had been specifically excluded from the Act of Toleration of 1691, and it was less than 40 years since Catholicism had itself been decriminalised by the Act of 1778. The church had a raised sanctuary, and a sacristy was later added to the south of it. The church reached the boundary of the adjoining 18th century house. One of the reasons that the site on Albion Hill had been selected was that it was near to the Barracks, which housed a large number of Irish soldiers. But after the Reform Act of 1829, the number of Catholics in Ipswich grew, and it quickly became obvious that the church was not big enough. And so, in 1838, Pere Simon and Margaret Wood raised the funds for the construction of what would be the first large Gothic revival church in the county of Suffolk. It was eighty feet long, in the Early English style, and built across the church of St Anthony so that the old church formed the transepts of the new. 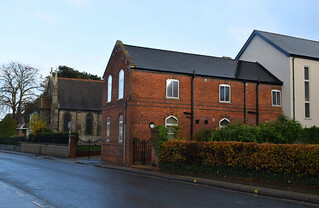 The sanctuary was built to the south, with the other end of the church forming the main entrance, a liturgically west front onto Woodbridge Road. Because the new church was so close to the road, the windows had to be protected with iron railings, so that the congregation could not be stoned during Mass. Remarkably, the railings survive to this day. 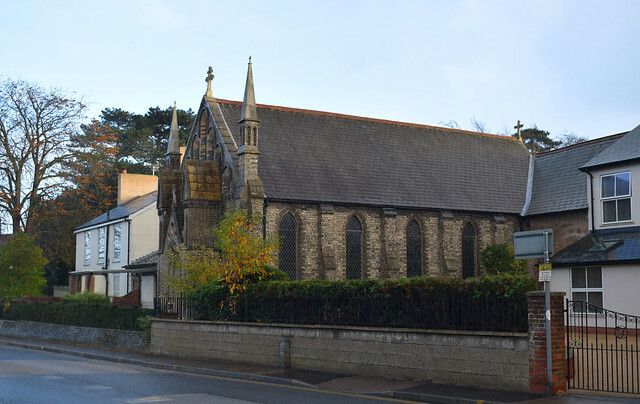 The new church was consecrated on 10th October 1838, and dedicated to Our Lady of Grace. This was the dedication of the pre-Reformation shrine of Our Lady of Ipswich, destroyed by the state authorities in 1538, exactly 300 years before. Our Lady of Grace marked the return of the Church to Suffolk in all its glory, and it is a pity that the dedication was reduced in common usage to simply St Mary. And then, Pere Simon died. His friend Margaret Wood followed, shortly after. But they had done enough to re-establish the Faith in Ipswich. The story of the Catholic revival in England is a well-known one; suffice to say, Ipswich shared in its ups and downs. From 60,000 Catholics in England at the time of the 1778 act, there were more than a million by 1850. Ipswich experienced a similar growth in its Catholic population; after the death of Pere Simon, it was served by priests from Bury and Withermarsh Green for a few years. And then in 1850, the restoration of the Catholic hierarchy placed the town in the Diocese of Northampton. The new Bishop appointed a permanent Parish Priest, Father Kemp, in 1854. He established a second Mass centre in the Parish in 1860, right in the centre of town. This was St Pancras, and it was built right in the most populous part of St Mary's Parish, the Rope Walk/Cox Lane slum area. In a much more confident red-brick Gothic style than its mother church, it is in fact only part of what was planned by its exuberant architect, George Goldie, to be the Cathedral of a future Diocese of East Anglia. But we are more than a century ahead of ourselves, and St Pancras would never be completed, never become the cathedral. Indeed, the new self-confidence of Ipswich Catholics would prove to be a little misplaced. The other Ipswich churches had maintained an amount of anti-Catholic feeling, continuing to preach the 'No Popery' sermons that had dissuaded civic dignitaries from attending the opening of Our Lady of Grace in 1838. The firebrand Protestant ministers whipped up a storm which, one night in November 1862, turned into an anti-Catholic riot. Crowds rampaged through the streets of Ipswich, attacking known Catholic businesses and homes. Their main targets were the two churches, and also the convent, which they besieged, attacking it with rocks and iron railings. Every window in the building was smashed. The Blessed Sacrament had been brought from Our Lady into the relative safety of the Convent chapel, and the community kept vigil through a night of violence and destruction. As is so often the case, the attack was the catalyst for increased warmth and toleration. The local press denounced the actions of the mob as a disgrace, and local dignitaries visited the community with messages of sympathy and support. Father Kemp became an increasingly popular and well-known local figure. By the end of the 19th century, the Catholic presence in Ipswich had itself become a part of the establishment. In 1919, the Diocese of Northampton made St Mary and St Pancras into separate parishes, the border between the two being just to the west of the railway bridge outside St Mary. Ipswich had expanded eastwards, engulfing the medieval parishes of Rushmere and Kesgrave, and in 1931 St Mary acquired a new Mass station with the construction of the church of the Holy Family and St Michael at Kesgrave. In the 1930s, the Parish acquired the 18th century house to the east of the church. This became the Presbytery. 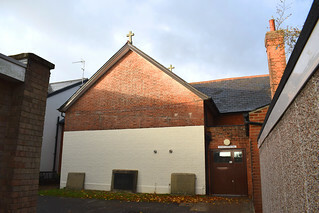 The Jesus and Mary schools continued to prosper, and the centenary of the arrival of the Order was celebrated in 1960 with the building of a new school chapel. The old church was no longer really large enough to accommodate the needs of parishioners and school communities in this densely populated part of the town. It is unfortunate, with hindsight, that the schoolchapel was built on the eve of the Second Vatican Council's liturgical reforms. Five years later, its design would probably have been quite different. It is a beautiful building, and was just what the Catholic community of Ipswich needed at the time. However, by the time the reforms came to fruition, Pere Simon's five acres of land contained, not one, but two substantial pre-conciliar churches. In 1976, the Diocese of East Anglia was formed. 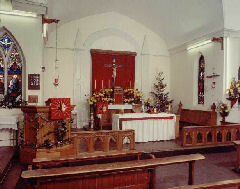 One of the last actions of the Northampton See was to designate the school chapel as the new Parish Church of St Mary. There are several reasons why this happened. It was the larger building, and more suited to liturgical needs; maintenance would be cheaper, and the Sisters were now withdrawing from the management of the school. But people have an emotional stake in the buildings in which they have seen their families baptised, married and buried, so it would be strange if the decision was not controversial, or even a little acrimonious. The Polish community had recently installed, at great expense, a beautiful stained glass window in the old church, and there was simply nowhere for it to go in the new church. Well, the new church has become well-loved; there is, in any case, no way that the old church could have accommodated the current average Sunday Mass attendance of almost a thousand people, spread across several masses. And so, the old church was converted into a parish hall. 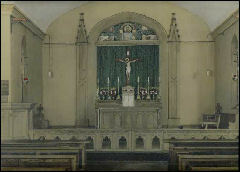 The three photographs below show the liturgical east end of St Mary's as it was when photographed in the 1930s, the 1970s and the 1990s. The fixtures and fittings were removed; the high crucifix was brought into the new church. 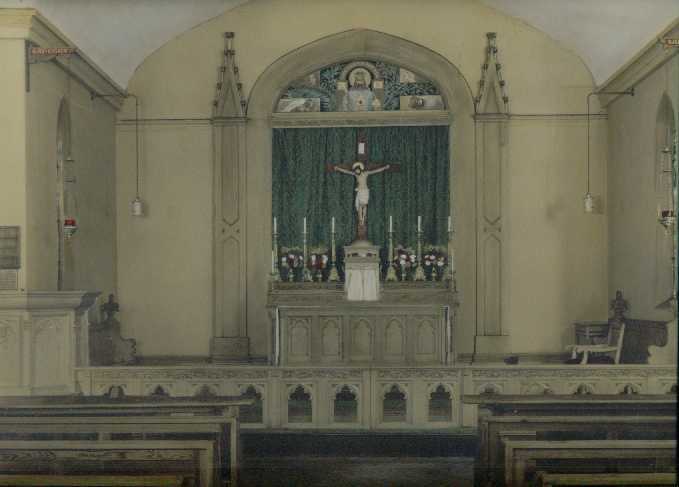 The old communion rails, no longer required under the revised liturgical arrangements, were incorporated into the front row of seats in the new church. The stained glass windows went their separate ways; Mary of the Annunciation went into the Presbytery, an Old Testament Prophet into the modern Primary school, and most of the rest into the library of Goldie's School of Jesus and Mary. When this closed in 1996, they were transferred to St Joseph's College in South Ipswich. The only remaining glass in the building is the Polish Community's window to Our Lady of Czestachowa, still in the middle of the west side. Several of the pews from the old church have also been retained in the building in its new use. The east transept of Our Lady of Grace was converted into a meeting room, the 'Pere Simon Lounge'. This had been the sanctuary of the original St Anthony, and still retains the fixings for the altar canopy from its days as the Blessed Sacrament chapel of Our Lady. The space to the north of it, the former graveyard, was filled in with toilets, a kitchen, and another meeting room, the Deanery Lounge. 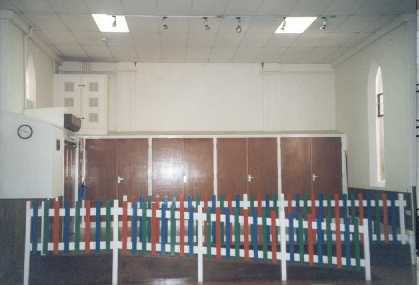 A stage was fitted where the main sanctuary had been, and cupboards built at each end. In 1998, when a pre-school playgroup began to use the building, this was fitted with colourful safety rails, and an access deck for wheelchairs and pushchairs. The former main entrance became a fire exit, a new entrance being constructed to the south, so that entry to and from the hall is within the campus. This is all well done, although a less attractive and successful part of the conversion is the low tiled roof, fitted to conserve heat and accommodate strip-lighting. Enough remains to show that this was once a church, including the wall-mounted memorials to Pere Simon and Mrs Margaret Wood. It is humbling to stand beneath them, and remember these two people who, almost on their own, restored the Catholic Faith to Ipswich after more than two centuries of exile.